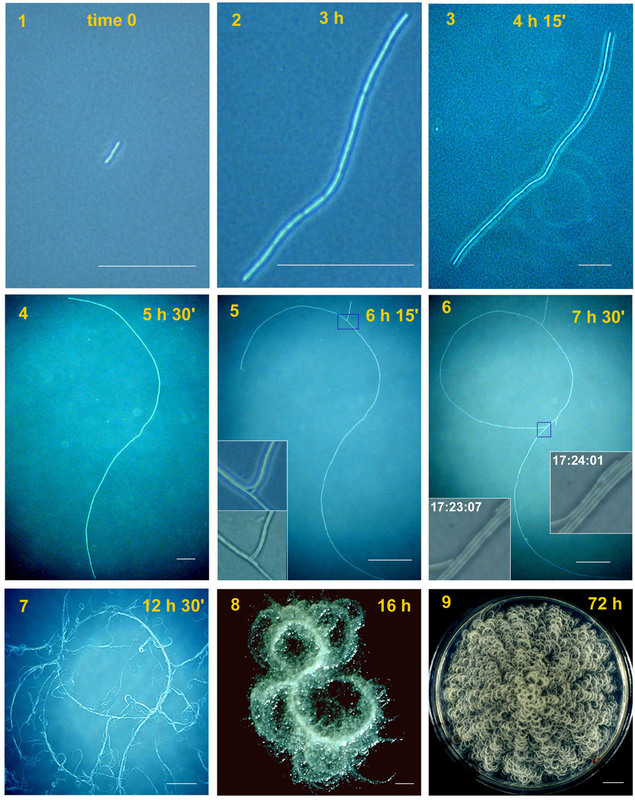 Bacillus mycoides Flügge, a Gram-positive, non-motile soil bacterium assigned to Bacillus cereus group, grows on agar as chains of cells linked end to end, forming radial filaments curving clock- or counter-clockwise (SIN or DX morphotypes). The molecular mechanism causing asymmetric curving is not known: our working hypothesis considers regulation of filamentous growth as the prerequisite for these morphotypes. SIN and DX strains isolated from the environment were classified as B. mycoides by biochemical and molecular biology tests. Growth on agar of different hardness and nutrient concentration did not abolish colony patterns, nor was conversion between SIN and DX morphotypes ever noticed. A number of morphotype mutants, all originating from one SIN strain, were obtained. Some lost turn direction becoming fluffy, others became round and compact. All mutants lost wild type tight aggregation in liquid culture. Growth on agar was followed by microscopy, exploring the process of colony formation and details of cell divisions. A region of the dcw (d ivision c ell w all) cluster, including ftsQ, ftsA, ftsZ and murC, was sequenced in DX and SIN strains as a basis for studying cell division. This confirmed the relatedness of DX and SIN strains to the B. cereus group. DX and SIN asymmetric morphotypes stem from a close but not identical genomic context. Asymmetry is established early during growth on agar. Wild type bacilli construct mostly uninterrupted filaments with cells dividing at the free ends: they "walk" longer distances compared to mutants, where enhanced frequency of cell separation produces new growing edges resulting in round compact colonies. Bacteria growing on agar plates display a variety of colony forms called "patterns" or "morphotypes" [1, 2]. Colony pattern, an important taxonomic element for early microbiologists, is the first step of differentiation occurring in a population of individuals otherwise identical. Advantages stemming from multicellularity and patterned growth in bacteria are several: increased proliferation due to easier diffusion of positive growth signals and from coordination of biochemical activities; access to nutrients that could not be reached by single individuals and collective defense against adverse conditions . Formation of bacterial colonies was analyzed by mathematical models as an example of complexity in open systems. Variables such as cyclic production of chemoattractants and chemorepellents, due to the amount of available nutrients or waste, were considered. Long range chemical signalling such as quorum sensing and production of secreted wetting fluid, all contribute to form the final colony shape . 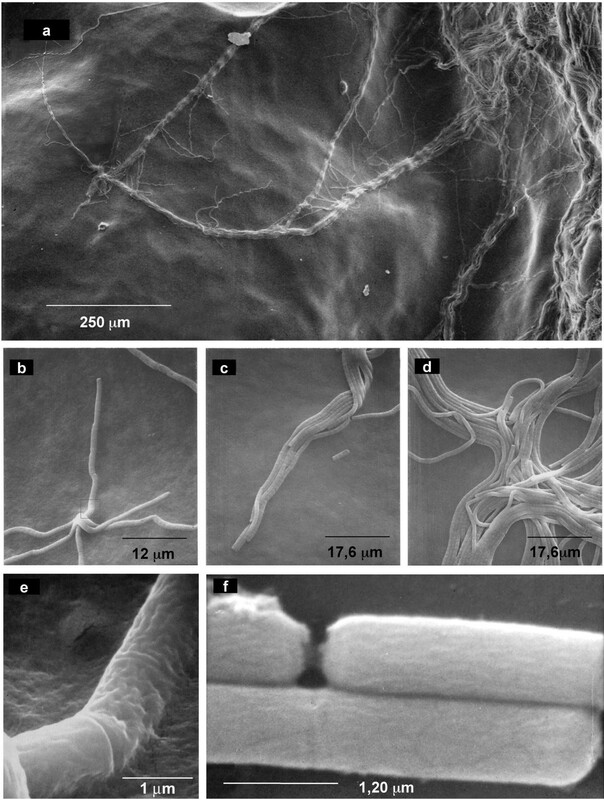 One example of bacterial colony with a sort of "differentiation" is that of the well studied filamentous bacterium Streptomyces: it is made by rarely septated substrate hyphae and by an aerial mycelium divided into compartments, each producing a spore [5, 6]. The colony shape starting from one or a few cells is usually symmetric but exceptions are found: asymmetric growth of bacteria produces chiral and vortex forms of the colony as in Paenibacillus dendritiformis. Asymmetry at the macroscopic level results from chirality of flagella of this bacillus [4, 8]. 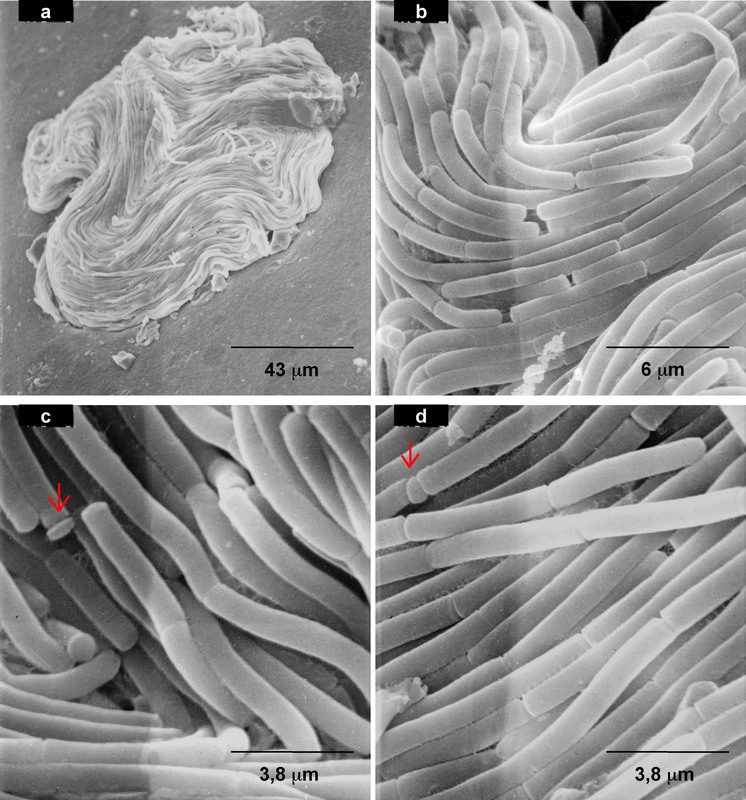 A multiple mutant of Bacillus subtilis also produces macrofibers with right or left-handed supercoiling. This interesting phenomenon is not due to handedness of moving flagella, but to twisting of cells that do not completely separate one from the other after septum formation [9, 10]. Rudner et al. suggested that emergence of patterns in B. subtilis cultures was due to other gram-positive bacteria co-existing, in very low amounts, with B. subtilis strains. These symbionts are distinguished into tip-splitting, chiral and spiral-vortex growing and belong to group I bacilli, as grouped by Priest , named B. alvei, B. macerans, B. popillae (now included into the genus Paenibacillus) and B. circulans. 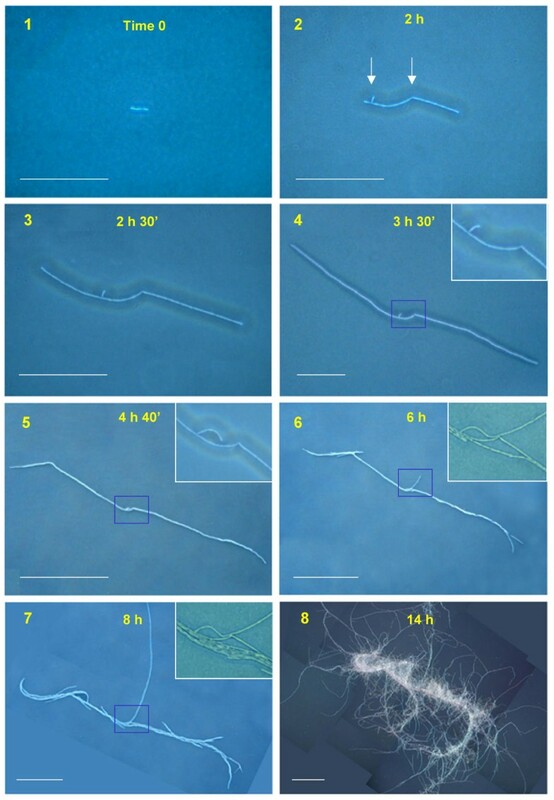 Colonies of a soil bacillus were perhaps the first to attract attention of microbiologists for their peculiar asymmetric hairy shape, made by bundles of filaments curving clock- or counterclockwise even if coming from the same species, as biochemical and physical properties indicated. The elaborated chiral colony pattern belongs to Bacillus mycoides, first described by Flügge in 1886. The author called the species "mycoides" due to fungal-like growth on agar plates of these rod bacilli as chains of cells forming filaments projecting radially and curving to the left or to the right. The molecular basis of the turn direction of filaments was puzzling for observers and chirality of these colonies was regarded as a procaryotic example of the diffuse asymmetry of organs in the animal and plant world. Gause  compared the physiology of dextral and sinistral strains finding that they shared metabolic properties, with some exceptions, for instance the ability to hydrolyze sucrose. He reported no conversion between dextral and sinistral orientations. Hypothesis was advanced that turn direction of filaments could be a consequence of an asymmetric distribution of the elastic structures of the cell wall, inducing twisting of the growing filaments upon unequal pressure of the internal turgor on the external envelope. After these early studies, very little new data about the subject appeared. We wanted to revisit the problem of how asymmetry is established in B. mycoides studying genetics of colony formation. The aim was to understand the molecular mechanism leading to the onset of the asymmetric morphotype. DX and SIN strains were isolated from the environment since the Type B. mycoides strain that we first obtained from a culture collection (Bacillus cereus var. mycoides, Institute Pasteur #6452) had lost colony turn direction. The two forms of B. mycoides were characterized by biochemical and molecular biology assays that confirmed their classification. Given similarity of colony shape, except for curving direction, the expectation was to find a common genetic background for the two morphotypes, with one or more sets of different genes, specifying the left or the right-handed curvature. On the contrary, the experiments described below, that evidenced different ribotyping and numerous base differences in the "housekeeping" dcw genic and intergenic regions sequenced, made clear that the left and right-handed strains did not stem from the same genome. Therefore we concentrated on the common genetic basis essential for constructing the hairy colony, that is filament making, looking for mutants of this character. We started by isolating B. mycoides strains from the wild. A soil sample from the Department garden was diluted into sterile water and plated on agar plates. Among colonies of several microorganisms, filamentous colonies as described for B. mycoides[12, 13] were found. Most displayed projections curving to the left hand (SIN), as seen from the bottom of agar plates, and fewer to the right hand (DX). Since colonies are in general observed from the bottom of the agar plate, due to vapor fuzziness under the lid, the names (DX-dextral and SIN-sinistral) were given to colonies seen in this way. On the agar surface the opposite is visible, that is DX filaments are curving counter-clockwise and SIN clockwise. Isolated single colonies were inoculated in liquid and solid media and two strains were selected for study. Colonies of the two forms are shown in Fig. 1. Colonies of Bacillus mycoides environmental strains. Colonies are formed by bacillar cells linked end to end in filaments running as bundles with a genetically determined curvature direction. At the left, DX, with projections curving clockwise and at the right, SIN96, with opposite curvature. Colonies are named as they are seen from bottom of the plate. Strains were grown at room temperature for 30 h on 1.5% agar TS plates. Scale bar = 1 cm. Positioning of the Petri dish at different angles towards the bench top did not change colony geometry of the strains. Experiments were conducted to see if curvature direction could be modified by a reduced gravity (microgravity). For this purpose colonies were grown on agar Petri dishes subjected to conditions of simulated microgravity, tied to the revolving plane of a three-dimensional clinostat. No modification of the colony patterns was observed (unpublished results). Since we were dealing with environmental isolates, we used the RAPD (Random Amplified Polymorphic DNA) test to confirm by a molecular marker that strains belonged to B. cereus group. This group is composed by B. cereus, B. thuringiensis, B. anthracis and B. mycoides. Total DNA was amplified from our isolates and from B. mycoides NRRL NRS 273T, B. pseudomycoides NRRL B-617T, B. thuringiensis BGSC 4D1, B. cereus Pasteur 6452 and B. subtilis BD366 (as a negative control), using the same primers. Primers had been designed as diagnostic for B. cereus group and negative for a panel of Bacilli. We found the expected specific 749 bp band in all strains, except for B. subtilis (Fig. 2). 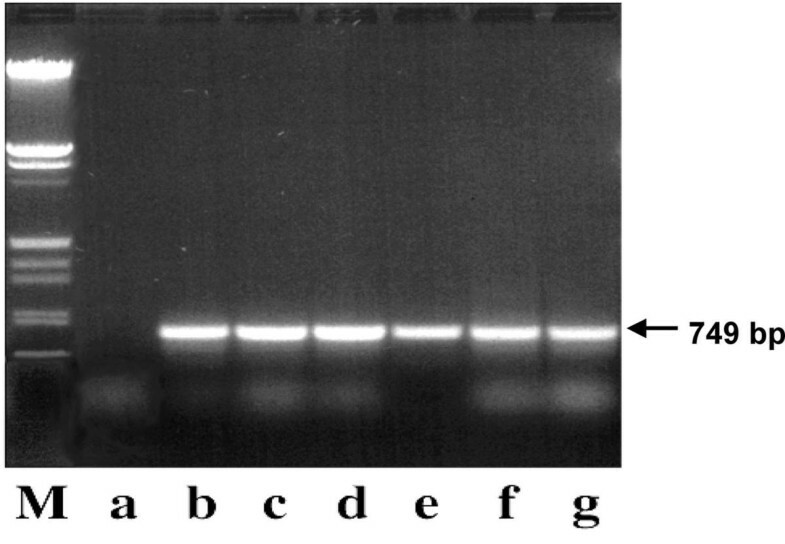 PCR amplification of a band diagnostic for Bacillus cereus group. 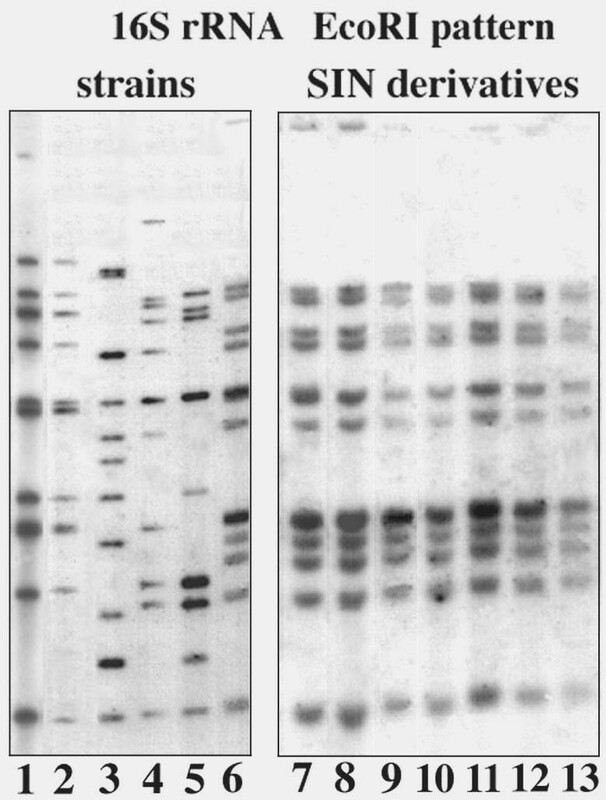 Total DNA of a panel of Gram-positive bacilli was amplified with primers producing a 749 bp band (arrow) specific for members of B. cereus group, according to Daffonchio et al. . (a) B. subtilis strain BD366, as a negative control, (b) B. mycoides SIN, (c) B. mycoides DX, (d) B. mycoides NRRL NRS-273T, (e) B. pseudomycoides NRRL B-617T, (f) B. thuringiensis BGSC 4D1, (g) B. cereus var. mycoides Pasteur 6452. M: EcoRI-HindIII digested phage λ DNA. Biochemical features of the new isolates were analyzed, along with B. mycoides Type strain, with the API50CH test (bioMerieux) that monitors 50 different enzymatic reactions using sugars as substrates. SIN and DX enzymatic activities were in the range indicated by the test for B. mycoides. A few minor differences of color intensity between SIN and DX were in the variability range reported for B. mycoides species (not shown). As in the case of the strains studied by Gause  our SIN strain was unable to hydrolyze sucrose. Several growth conditions were tested to check for colony morphotype stability. Different liquid and solid media (see Materials and Methods) all supported growth of the isolated strains and their specific colony pattern. Media at pH values ranging from 4.0 to 9.0 were tested: up to pH 5.0 the strains are unable to grow, nor do they resume growth when transferred to standard conditions. At pH 5.6 and over they can grow, the preferred range being between 6 and 8.5. Temperature range for DX and SIN growth was also analyzed. Both divide from 6°C to 37°C, with an optimum at 26–28°C. 38°C exert a bactericidal effect on DX, but not on SIN, which can survive, though not divide, up to 42°C, some cells being able to restart growth at lower temperature. Temperature over 35°C is deleterious for colony shape: both DX and SIN reduce filament length and at 37°C no turn direction is observed. In liquid media the typical morphology of SIN and DX is an aggregated phenotype: bacilli form small round clumps when well agitated and a single big clump when kept still. The surrounding liquid is clear and the aggregates can be disrupted only by very vigorous vortexing (Fig. 3). Mutant B. mycoides SIN strains loose aggregation in liquid culture. 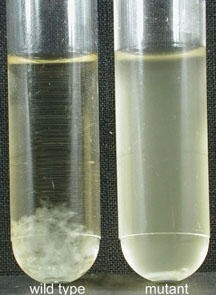 Wild type strains (left) grow forming aggregated clumps absent in mutants (right). The SIN and DX strains were analyzed for the presence of natural plasmids: two were found in SIN, 9.2 and 3.5 kb in length, while DX harboured 4 plasmids, 13.8, 10.5, 10.0, and 3.3 kb long. The smallest plasmids of the two strains were cloned and sequenced (EMBL acc.#AJ243967 and AJ272266). They belong to rolling circle replicating plasmids commonly found in Gram-positive bacilli. Regions homologous to single-strand and double-strand origins of replication (ss-ori and ds-ori) of B. cereus group plasmids are present. Open reading frames showing similarity to Rep and Mob proteins of many bacteria are present in both plasmids in the same position and orientation . A derivative of SIN called SIN96, which lost the larger plasmid but kept wild type morphotype, was the starting strain for the search of morphotype mutants. 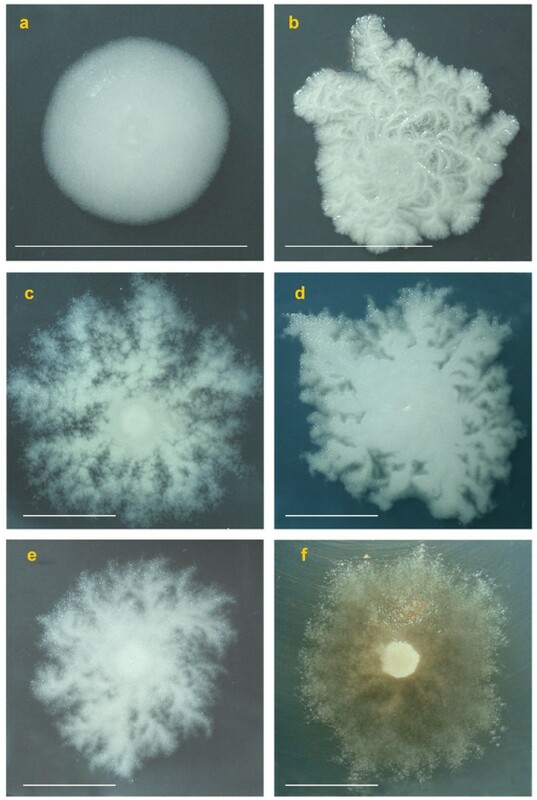 The first spontaneous mutant was a SIN strain that lost turn direction of the filaments on agar plates and aggregation in liquid culture (Fig. 3). Similar non-aggregated morphotypes appeared at enhanced frequency by culturing in liquid with Novobiocin, a drug used to cure strains of the endogenous plasmids . Morphotypes were found to fall into two main types: colonies with no turn direction of macroscopic protrusions, but still rhizoidal (that we define "cotton-like" due to their fluffy appearance), and colonies with a round and compact shape, similar to those of B. cereus. One example is SINett, followed by light and electron microscopy during colony formation. Other mutants, occurring only once during screening, were: CIC, which neither lost aggregation in liquid culture, nor turn direction of the filaments, but had shorter and thicker trunks and CAD, no more rhizoidal, with reduced adherence to agar (Fig. 4). SIN96, with wild type morphotype, is in the center of Fig. 4 and some morphotype mutants at the periphery. All were inoculated at the same time with the same cell numbers. The reduced degree of space colonization of the mutants compared to wild type is apparent. Closer inspection showed that apparently similar mutants differ one from the other, mostly among cotton-like colonies, as shown in Fig. 5. Colony mutants derived from SIN96 strain. Strains were grown on 1.5% agar medium for 50 hours at 25°C. 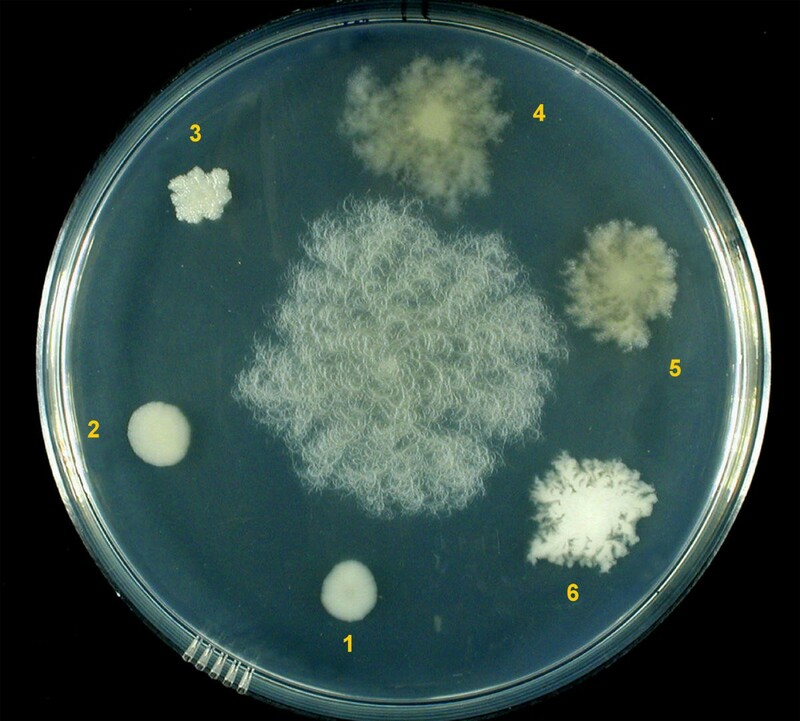 The colony in the center is SIN96, with wild type morphotype and mutants at the periphery: 1) SINett, 2) CAD, 3) CIC, 4–6) cotton-like colonies. Colony mutants. a) SINett, b) CIC with shorter and thicker trunks, c-d-e-f) cotton like-mutants with different texture and color. Scale bar = 1 cm. Mutant colonies were checked for ribosomal DNA EcoRI restriction pattern (ribotyping) to ascertain strain lineage and lack of gross genomic rearrangements. Location of ribosomal clusters inside the genome gives a reproducible pattern of restriction bands which is useful to trace single colonies as belonging to the same strain . EcoRI digested total DNA was hybridized to a synthetic oligonucleotide chosen in the very conserved part of 16S rDNA of group I Bacilli . In Fig. 6, ribotyping of several Bacillus strains shows that they differ for many bands, while all of the mutant colonies derived from SIN96 maintain the parental pattern. Ribotyping in Bacillus strains. A blot of EcoRI digested total DNA was hybridized by a probe specific for an evolutionarily conserved region of 16S rRNA. 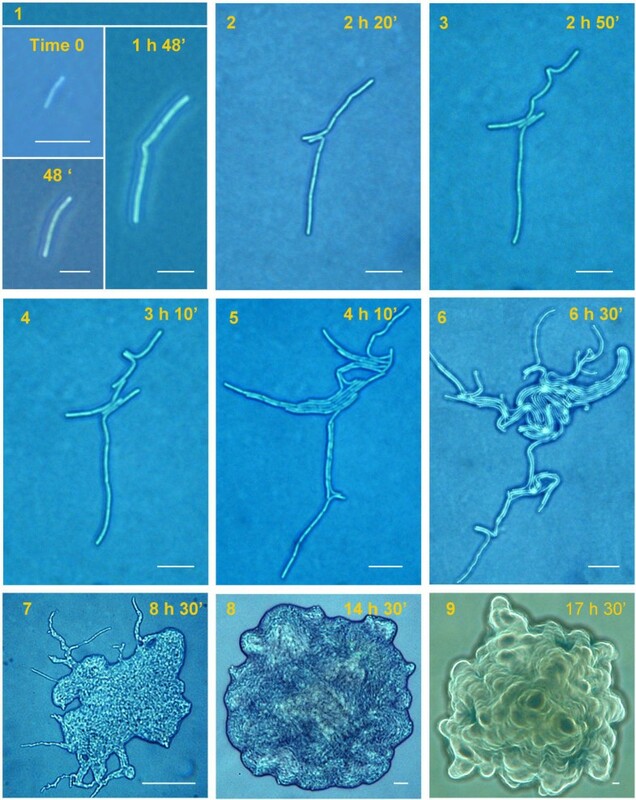 Various members of the B. cereus group show different patterns: lane 1, B. mycoides ATCC 6462T; lane 2, B. mycoides DX; lane 3, B. pseudomycoides NRRL B-617T; lane 4, B. mycoides NRRL NRS-273; lane 5, B. thuringiensis BGSC 4D; lane 6, B. mycoides SIN. Mutant strains all derived from SIN96, with identical patterns: lane 7, B. mycoides SINett; lane 8, CAD; lane 9, CIC; lane 10–13 cotton-like mutants. With the help of an optic microscope we could follow colony formation starting from one or a few cells seeded on agar plates. Figures 7, 8 and 9 show a series of pictures which depict colony formation of wild type SIN and DX strains and of the SIN mutant with round compact colonies, SINett. We examined large numbers of colonies during growth and the examples in the panels reflect the typical pattern of each strain. Growth of SIN on agar as seen at the light microscope. Starting from 3 cells (1) the filament grows by division of the cells at both edges (2,3,4,5). The ramification and angle, pointed by arrows in (2), remain at the same distance in the following stages confirming growth at the periphery. In (6) the curvature specific for the strain is apparent at both ends. New filaments start from rupture points, running along the first filament (7) and projecting outside. Insets show enlargements of the region pointed by arrows in panel 2. In (8), advanced stage of colony formation: the structure is enriched by many filaments, becoming as in Fig. 1 after 24 hours. Scale bar: 1–4 = 100μm; 5–8 = 500 μm. Growth of DX on agar as seen at the light microscope. The filament starting from 3 cells in (1) grows at the periphery (2, 3) and in (4) the specific curvature appears at both ends when the filament is still unique. In (5) the first ramification occurs, enlarged in insets that show duplication and rupture of the filament. In (6) the circle is closed and insets show the rapid cell progression at the closure point. In (7) many lateral ramifications emerge. In (8) these ramifications converge in a few big trunks displaying the specific curvature. In (9) the final shape of the colony is shown. Scale bar: 1–4 = 100 μm; 5–8 = 500 μm; 9 = 1 cm. Growth of SINett on agar as seen at the light microscope. In this SIN mutant a bent appears at an early stage of colony formation (1) and a double rupture occurs (2). From these ruptures 3 parallel filaments start growing (3). In (4) new ruptures in the upper filament appear. In (5–6) many filaments aggregate in bundles covering the central part of the starting filament. Note that magnification is the same in these 6 figures. In (7) the colony covers almost all of the central space. In (8–9) the final shape is shown. Several layers of cells are superimposed. They appear more evident in (9) where the picture was taken with a filter. Scale bar: 1–6 = 20 μm, 7–9 = 100 μm. Wild type SIN is shown in Fig. 7. A lag period of 1–4 hours usually follows seeding of single colony forming units: here, a filament containing a few cells is visible after about two hours (Fig. 7/2). In this colony a ramification, due to a new cell growing from a splitting of the filament, and an angle appeared (shown by arrows in Fig. 7/2). These were the reference points that, by remaining at the same mutual distance, made clear that growth was due to division of the edge cells only. In fact, the number of cells remains the same inside the central structure (see insets of Fig. 7/4 and 7/5). After 5 hours (Fig. 7/6) a curvature appears at both edges, typically turning clockwise. At later times new filaments running parallel to the previous ones arise at breakage points between two adjacent cells. Others start at an angle with the founder filament and expand towards empty spaces. After 10 hours many filaments run in parallel with the main trunk and new curly trunks are present on the plate. Fig. 8 shows a DX colony. As for SIN, the filament grows from the edges, that both curve counterclockwise. The first ramification occurs at later times (Fig. 8/5). Insets show one mode of rupture formation: a filament following the upper ramification first bends and then breaks forming two growing points that eventually duplicate the founder filament and the ramification. In Fig. 8/6 additional ramifications appear and the circle is formed with more than one filament (see insets). In Fig. 8/7 many filaments follow the road opened by the founder filament and many lateral filaments emerge. After 16 hours (Fig. 8/8) the initial shape of the founder filament is still recognizable, together with new big trunks with the strain specific curvature. In Fig. 8/9, at 72 hours, the plate surface is completely covered. Colony formation of these two wild type strains follows the rule of leaving the initial location on the agar surface towards a centrifugal direction, mostly by division of the outer cells. The mutant SINett behaves differently (Fig. 9). At first cells divide in a linear array like the wild type, but, after a short time, cells internal to the string divide creating tensions that make cell edges detach one from the other and form ruptures that become new growing edges. The process is repeated again and again, to fill all of the space close to the founder filament until it is completely covered. No growth occurs at the outer cells of the first filament which remain at about the same distance. The cells that remain outside the growing mass are often subjected to autolysis, leaving the colony borders without projections (Fig. 10). Autolysis of filaments. Magnifications of two details of Fig. 9/7, showing degradation of filaments remaining outside the colony mass. B. mycoides colonies on agar were observed also at the scanning electron microscope. SIN96, with wild type morphotype, is shown in Fig. 11. Migration of many filaments out of the colony mass is apparent at low magnification in Fig. 11a. Details of the same region are shown in b, c, d, e, f. Cells at the growing edge move in two different ways. Some cross one over the other following independent routes (11 b) while others converge along the way (11c). Filaments can join and then separate, resembling motorway junctions (Fig. 11d). No twisting of filaments one around the other, nor of cells around their axis is visible, even at high magnification (Fig. 11e and 11f). Scanning electron microscopy of wild type SIN colony on agar plate. Bacilli form filaments expanding on agar towards periphery, leaving wide empty spaces (a). Trunks fuse proceeding together, or separate. Details of the same picture show pioneer filaments proceeding independently (b), going in parallel (c), fusing and separating (d). High magnifications (25–30.000 X) of the SIN cells show no twisting of the structures of the external cell wall (e-f). Morphology of the mutant SINett on agar is shown in Fig. 12. The shape of an entire colony, made by filaments forming parallel wavy bundles around the colony center, is visible in Fig. 12a. Details of the same colony are in panels 12b, 12c, 12d: filaments contain cells completely separated one from the other, much more frequently than in wild type colonies. Some minicells are present. The basic structure of the mutant is a filamentous organization as in the wild type, even though these round compact colonies appear at the macroscopic level similar to those of non-filamentous bacteria. Scanning electron microscopy on agar of the mutant SINett. In (a) the entire colony at 9 hours. At variance with wild type, all bundles turn towards the colony center. 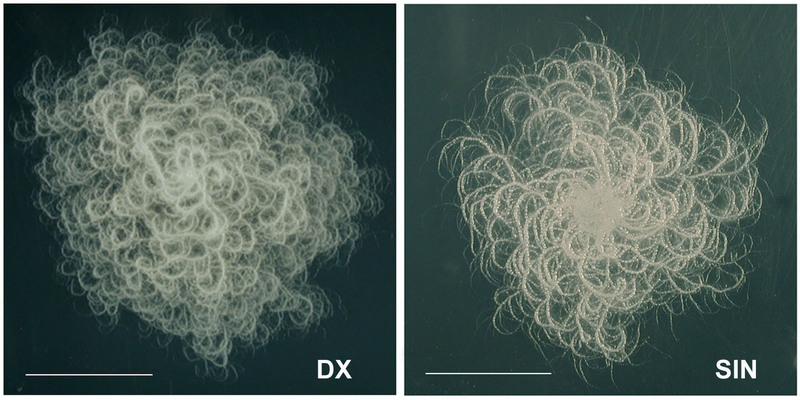 (b) shows frequent cell separations along the filaments; (c-d) show the presence of minicells (indicated by arrows). The genes coding for the proteins assembling at the division site of bacillar cells are mostly clustered, together with those specifying enzymes for the synthesis of peptidoglycan. The cluster dcw (d ivision c ell w all) is well conserved among bacilli with respect to gene order . Very little is known about B. mycoides at the genomic level: knowledge of the genes involved in fundamental steps of cell division appears as a necessary base for studying the processes of colony assembly. We therefore started to characterize the dcw cluster in DX and SIN strains. Due to high conservation of the main protein of the cluster, FtsZ, in bacteria and even in eukaryotic chloroplasts  we could design forward and reverse degenerate oligonucleotides inside two regions of the protein with maintained amino acid sequences. Amplification by PCR of total DNA of DX and SIN strains gave a DNA fragment whose sequence had high homology to the corresponding region of B. anthracis ftsZ gene (sequences provided by TIGR, The Institute for Genomic Research). Homology was such that we could subsequently design oligonucleotides based on B. anthracis genome for chromosome walking upstream and downstream of the ftsZ sequence first determined. Fig. 13 shows comparison of DX and SIN amino acid sequences along four genes, ftsQ, ftsA, ftsZ and murC. DNA spacer sequences (not shown) between genes are less conserved than coding sequences. In particular the spacer that separates ftsZ from murC is much longer in the SIN strain compared to DX and to B. anthracis. The same spacer region was analyzed in B. mycoides Type ATCC 6462 strain and in B. pseudomycoides Type B617 strain . The ATCC 6462 Type strain is 100% identical even along this spacer to DX, once more confirming classification of the strain. The more divergent was found to be B. pseudomycoides, whose colonies are very similar to those of B. mycoides DX, with the same direction of filament curvature. The lower similarity at the gene sequence level confirms a greater genetic distance of this species from the other members of B. cereus group . Sequence conservation. Translated ORFs of a region of the "division cell wall" cluster of B. mycoides SIN are compared to those of other Bacillus cereus group members. Numbers indicate percent of identical amino acids in the ORFs. For every genetic approach the possibility to transform strains with DNA is essential. Many protocols of protoplast transformation and of electroporation were tested on our environmental strains with no success. With a few modifications of the Macaluso protocol  two strains, SINV6 and Ett, were transformed with the recombinant plasmid SIN-HPS9 (not shown). It is made by the union of the shuttle vector HPS9, carrying two antibiotic resistances  with the smallest 3.4 kb cryptic plasmid of the SIN strain, pBMY1 . Efficiency however was very low and needs to be further improved. In the present study variant morphotypes of B. mycoides SIN strain were collected in search for mutant gene/s coding for the chiral colony shape. Colonies were found that lost the peculiar wild type shape made of filaments aggregating in bundles with the same final curvature: some acquired a cotton-like appearance; others made round compact colonies; one became less adherent to the agar surface. The new morphotypes were not seen to revert to wild type during several transfers on agar media. All of them lost ability to form aggregates in liquid culture: cells detached easily one from the other and grew in suspension conferring turbidity to the medium. The observation that mutant morphotypes fall into several different classes strongly suggests that many genes are involved in the process of colony shape formation. We explored the possibility that a genetic determinant could be carried by a plasmid, but strains fully cured of the two cryptic plasmid of the SIN strain maintained wild type morphotype, ruling out this hypothesis. We compared the sequence of ftsQ, ftsA, ftsZ and murC of wild type SIN with that of the SINett mutant, whose morphotype with round colonies is the most altered, but not a single nucleotide was changed, indicating that mutations affect other genes, probably regulator genes. It is interesting that mutant morphotypes were able to colonize a reduced territory area compared to wild type: presumably territory conquest must be crucial for a soil inhabitant to reach new nutrients in natural environments. Possibly this trait is under selective pressure and positively selected for. Consistent with the hypothesis of filamentous growth as an adaptation to search for nutrients we noticed an increased colony diameter of SIN strains when grown on media with low nutrient concentration (unpublished observation). Determination of the growth curves in wild type and mutant strains put into evidence that mutants were not negatively affected for the time needed to duplicate, which was found to be similar if not identical during logarithmic growth. On the contrary, mutants were found to persist in the logarithmic period for a longer time during culture in liquid media, resulting in an increased mass compared to wild type strains (unpublished results). Peculiarities of colony formation were followed by light and scanning electron microscopy. In wild type strains, cells move away from the colony center as single filaments or as bundles. Single filaments can leave a bundle and join other bundles. When filaments coming from different directions meet, they may converge, or alternatively cross one over the other continuing along their route. We do not see twisting of one filament around another as in the case of the B. subtilis macrofiber-forming mutant . Mutant strains also form bundles of filaments, but, instead of leaving the mass, they turn all together back towards the colony center. It is unlikely that a repelling substance, secreted by wild type strains, may be the driving force for cells to spread away from the colony mass since this in contrast with the formation of bundles. We rather hypothesize a greater "independence" of wild type strains from growth substances released from the mass of bacteria. This would permit colonization of empty spaces where no such substances are present. Moreover the strong aggregation that wild type strains show in liquid culture is a consequence of the tight head to head contact of cells after division, probably due to a molecular "glue" or to incomplete separation of the cells after septation. Other attracting forces, like side by side cell stickiness, are present also in mutants, as seen on agar where they form parallel wavy bundles. However this kind of attraction is weak, since mutant cells easily separate in liquid culture mostly as single units. Very little is known about B. mycoides at the genetic level. Our soil isolates of DX and SIN share metabolic traits, such as the ability to metabolize substrates, with the exception of sucrose hydrolysis. Genomic organization is not the same, as estimated from ribotyping and plasmid content. At the gene sequence level, as determined for some genes of the division and cell wall cluster, DX and SIN strains appear very close, but not identical. Nucleotide and amino acid sequences are more similar in these two strains than with the ones of the close B. anthracis and B. cereus species. The FtsZ sequence of B. pseudomycoides is the most divergent, confirming a greater phylogenetic distance of this species from the other members of the group . As for the molecular mechanism underlying asymmetry of the colony, we obtained mutants that lost this character. This is an essential preliminary step towards the possibility of transforming and complementing the null mutation with wild type long DNA sequences, in search for the gene/s guiding the turn direction morphotype. For this purpose we are now working to increase the very low transformation efficiency of our strains. Bacillus mycoides forms colonies with cells linked end to end into filaments curving clock-or counterclock-wise. Aggregation in liquid media and chiral configuration on agar, but not organization into filaments, is lost in colony mutants. Analysis at the light and scanning electron microscope during colony formation shows that in wild type strains it is the outer cell of filaments that preferentially divides. In the mutant strain Ett, cells internal to the filament divide, causing breakage points which become new edges for cell division, occuring mostly close to the colony center. It is regulation of cell separation that appears modified in mutants, changing wild type ability to form long filaments invading large spaces. Environmental DX and SIN strains were found similar, but not identical, in the genes coding for FtsQ, FtsA, FtsZ and MurC, indicating that they do not stem from the same genome. The environmental strains were tested by PCR amplification of total DNA with primers producing a 749 bp fragment diagnostic for the Bacillus cereus group . 10 ng total DNA was amplified for 35 cycles (1 min at 94°C, 1 min at 45°C, 2 min at 72°C) with primers 5'-ACTGGCTAATTATGTAATG-3' and 5'-ATAATTATCCATTGATTTCG-3' in 25 μl final volume containing 2.5 μl 10X buffer (Perkin-Elmer), 200 μM each dNTP, 1.5 mM MgCl2, 1.0 μM primers and 1.5 U. AmpliTaq polymerase (Perkin-Elmer), covered with 50 μl mineral oil. Samples were analyzed on 1% agarose gels in TBE buffer . Liquid cultures of SIN and DX were analyzed with the bioMerieux API 50 CH test strips in parallel with liquid cultures of B. mycoides and B. pseudomycoides (strains NRRL NRS-273 and NRRL B-617T respectively, kindly provided by L. K. Nakamura, Dept. of Agriculture, Peoria IL). Bacterial pellets were lysed in 0.1 M EDTA, 0.1 M Tris-HCl pH 9.0, 1% SDS at 65°C for 1 hour. The viscous solution was made 1 M K-acetate, incubated 30 min in ice and centrifuged. Supernatant was precipitated with 0.7 volumes isopropanol and washed twice with 80% ethanol. DNA was digested with EcoRI, electrophoresed on 0.8 % agarose in TBE and blotted to Amersham Hybond N+. The filter was hybridized with a 20 mer oligonucleotide with the sequence 5' GAGTTTGATCCTGGCTCAGG 3', from the conserved 16S region of the group I bacilli (B. cereus, B. thuringiensis, B. anthracis, B. mycoides), 5'-end labelled with 32P-γATP and polynucleotide kinase. Cultures were grown to the mid-log phase (A 600 nm = 0.4) in LB at 30°C and cells pelleted, washed with isotonic buffer and incubated for 1 hour at 37°C with light shaking in sol. A (20% sucrose, 10 mM Tris-HCl pH 8.0, 50 mM NaCl, 10 mM EDTA, 10 mg/ml lysozyme, 100 μg/ml DNase free RNase). Cells were treated at room temperature with 0.2 N NaOH, 1% SDS for about 10 min. The solubilized cell content was neutralized with 5 M K-acetate pH 4.8 and after 30 min at 0°C the supernatant cleared by centrifugation and nucleic acids precipitated with 0.7 vol. isopropanol. The pellet was washed with 80% ethanol, resuspended in TE and run on a 0.8% agarose gel with supercoiled plasmids (BRL) as reference M.W. markers. Two different methods were employed for inducing loss of the plasmids of the SIN strain. High temperature: cells were plated in Petri dishes with agar (0.8 g/l) in LB and incubated 8–18 hr at 37°C. Treatment with Novobiocin : cells were treated in liquid LB at 30°C for 48–72 hr with 0.2 μg/ml of Novobiocin (Sigma), with daily changes of the antibiotic containing medium. An inverted Zeiss Axiovert 25 and a digital camera Nikon Coolpix 990 were used for colony observations. Colonies of SIN and DX, grown for a few hours at room temperature on the surface of 1.5% agar LB plates, were fixed in 2.5% glutaraldehyde in 0.1 M cacodylate buffer as minute square pieces. Samples were rinsed with buffer and postfixed in 1% OsO4 in Zetterquist buffer for 5 hours. After washing in buffer, they were dehydrated by passage for 30 min each through a graded ethanol series. After critical point drying, samples were coated with gold. Samples from liquid cultures were fixed and postfixed on glass coverslips like the colonies, with shorter dehydration times. Samples were examined in a Hitachi (Tokio, Japan) S-570 scanning electron microscope. Oligonucleotides for starting FtsZ sequencing in SIN and DX were designed inside two very conserved amino acid tracts of the FtsZ protein . Nucleotide sequences of these regions in B. halodurans, B. subtilis, L. lactis and B. anthracis (from TIGR) were considered for synthesising two degenerated primers: Zdir, 5' AAAGTWATCGGTGTCGGCGGWGGC 3' and Zrev, 5' CRGAAATMCCTTGAACMCCTTGRCG 3'. 200 ng of total DNA from DX and SIN were amplified in 50 μl mix, containing 1.5 mM Mg, 0.2 mM dNTP, 0.8 mM primers, 5 units of Amplitaq (Perkin Elmer). Conditions were: 5 min at 95°C; 30 cycles: 1 min 94°C, 1 min 65°C, 1 min 72°C. PCR products were purified from agarose gels by the Concert™ Rapid Gel Extraction System (Gibco BRL) and sequenced by M-Medical sequencing service. For further sequencing, 20 bp oligonucleotides were synthesized based on DX and SIN sequences and on B. anthracis unfinished whole genome sequence – preliminary sequence data was obtained from The Institute for Genomic Research website at http://www.tigr.org – and used in pCR reactions as above. When primers did not work on B. mycoides DX and SIN DNA, they were made degenerated in the third base when complementary to a coding B. anthracis sequence. We followed the protocol by Macaluso et al. with the following modifications: cells in the exponential growth phase were used; electroporation cuvettes were 0.2 cm instead of 0.4 cm wide, at 100-Ohm instead of 5-Ohm; growth in non-selective medium after electroporation was extended to 3 hours and growth in selective liquid medium was for 5 days. Recombinant plasmid SIN-HPS9 used for transformation was obtained by inserting NdeI digested pBMy1  into the unique NdeI site of the shuttle vector pHSP9 . The recombinant plasmid was amplified in Bacillus subtilis BD366 (BGSC-1E6). Less than 200 B. mycoides transformants were obtained per microgram DNA. GenBank accession numbers for SIN and DX sequences are AY129554 and AY129555. This work was supported by funds from University "La Sapienza" of Rome, from Centro di Studio per gli Acidi Nucleici CNR (Consiglio Nazionale delle Ricerche) and from ASI (Agenzia Spaziale Italiana). L. K. Nakamura of Department of Agriculture, Peoria IL, kindly sent us B. mycoides and B. pseudomycoides Type strains. D. L. Zeigler, BGSC Director, Department of Biochemistry, Columbus OH., provided us with B. subtilis and B. thuringiensis strains. We thank Fioretta Palombi for helpful advice and discussion and Quinto Giustiniani for SEM preparations: both are in the Dipartimento di Istologia ed Embriologia Medica, Facoltà di Medicina, Università "La Sapienza". Roberto Gargamelli produced photographic reproductions. Preliminary sequence data of the unfinished B. anthracis genome was obtained from TIGR, The Institute for Genomic Research, website at http://www.tigr.org. CDF carried out isolation and characterization of wild type and mutant strains and microscopy. EB did manuscript writing and sequencing: both designed the experiments. GP did sample preparations and gave a basic technical support. TS worked at the project as a graduate student. GT conceived the study and participated in design of the project and coordination. All authors read and approved the final manuscript.